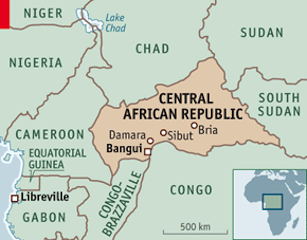 Most people I talk to have never heard of CAR or the Central African Republic. When I’ve mentioned it before, people have actually asked if it’s a real country. Even in France, those who have heard about it are those who know an aid worker who did their first mission there. For French NGOs it seems to be the kindergarten or training ground for humanitarians. So why is this African country only now reaching the pages of some of the world’s most famous newspapers and journals? Since independence in 1960, the landlocked nation of CAR has send constant instability and poverty, including high rates of malnutrition. This particular conflict started in December 2012. The rebel group, Seleka, claimed that the government, run by President François Bozizé, was not confirming to peace agreements signed in 2007 and 2011. Sekele took power from the former President on 24 March 2013, with the new Muslim leader Djotodia. FOMAC, the Multinational Force of Central Africa peacekeepers, have been in the country since. They are composed of troops from Chad, Gabon, Cameroon, Angola, South Africa and Republic of Congo. The current crisis involves over 4.5 million people which is practically the country’s whole population. There are over 60,000 refugees already in neighbouring countries and nearly 400,000 IDPs. Medical equipment, supplies and administrators are minimal. What are the papers saying? Time – More French troops head to CAR. Today (7 December) Courtney Subramanian (@cmsub) claims the capital is on the brink of anarchy. President Hollande has announced that he is increasing the number of French troops headed to CAR from 1,600 to 6,000. Washington Post – On Friday, Sudarsan Raghavan, wrote from Nairobi about bodies in the street of the capital that had been killed with knives or machetes. The Post claims that sectarian bloodshed besieges the capital killing scores. Le Monde – one of its leading articles talks about an intervention that is commendable but unpredictable and hazardous. Le Monde recognises that despite France’s regular role in the country, a lasting solution has not yet been achieved. Most victims are not combatants but have suffered due revenge or retaliation attacks in an environment of fear, religious hatred, chaos and terror. But ‘Il n’est pas trop tard pour agir.’ The reasons for French intervention – to secure the country and gain access for the delivery of humanitarian aid – are not questioned, but gaining an UN resolution was the easy part. The plan was for elections to take place in February 2015 but that leaves little over a year to establish security and peace. However, this crisis did not start with the March 2013 coup, instead this situation is the culmination of dereliction, rigged elections, a lack of security and humanitarian crises starting years ago. Frankfurter Allgemeine Zeitung – In Almost 300 Dead, including Civilians we learn about a two day summit on peace and security in Africa in Paris where CAR was the central topic of the discussion between 30 heads of state. El Pais – French troops unfold in CAR is based on reports from MSF. Human Rights Watch’s Peter Bouckaert (@bouckap) has written from the field: Dispatches. Reuters – reports that French soldiers were greeted with cheers as they went on patrol. I hope that this blog will be out of date within hours or days as the world finally wakes up to a long forgotten crisis. Are you in CAR right now? Send us any reflections, details or a full blog for us to share with our readers. Please sign our petition to get United Nations troops in C.A.R. The French and African Union forces need the support of the international community and the reinforcement of United Nations Peacekeepers.